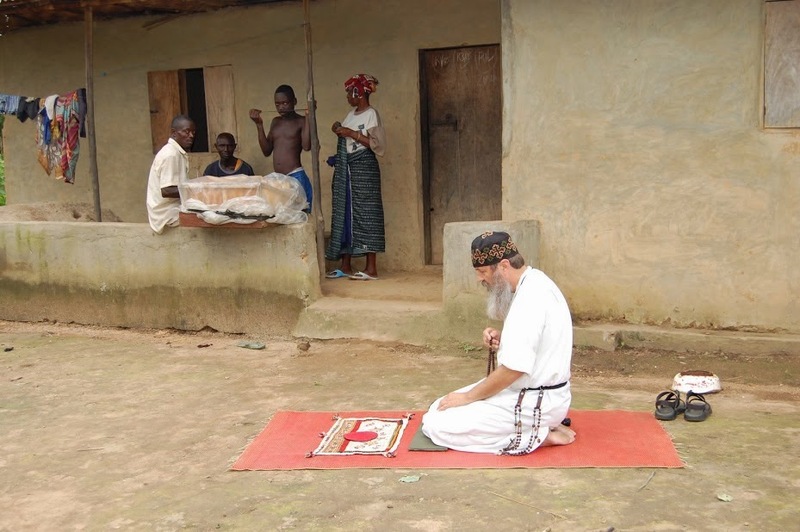 always offer him a prayer mat to use as he faces East to pray. The late Fr. Alexander Schmemann remarked that the history of the West is a history of radical discontinuities while the history of the East is one of radical continuities. Every spiritual force inevitably decays as it moves away from its original source. Living a life hidden in prayer brings us back to the original Source. The Prayer Rope is our spiritual umbilical cord keeping us connected to our source and destination. 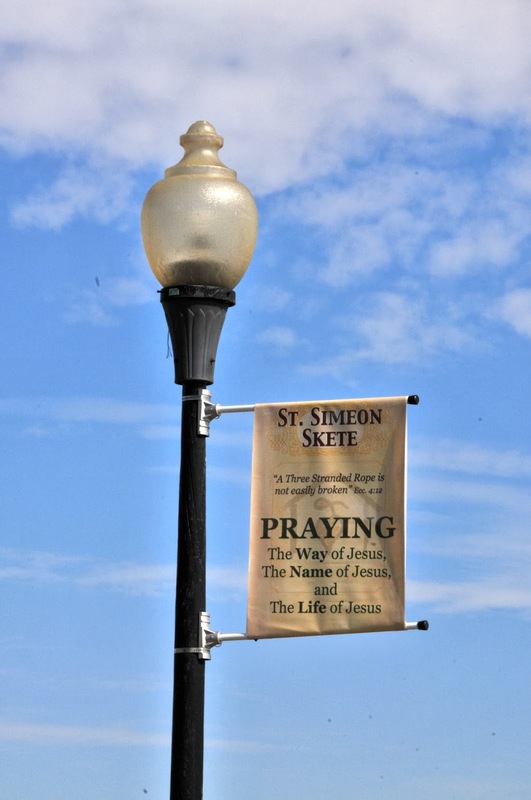 St. Simeon Skete's Three-Stranded Prayer Rope constitutes the very essence of religion and is the environment in which that essence is best expressed. From apostolic times Christians have turned in prayer toward the east and in facing that direction have bowed to God. St. Basil the Great (329-379) stated: "Therefore we all look to the east during prayer, but few know that we are in search of our original home, Paradise, which God planted in the Garden of Eden, to the east" (Gen. 2:8). The invoker's compass points unwaveringly to a direction from which our expectation of hope is to appear. A single geographical direction for prayer transforms the entire earth into one vast place of prayer. Ultimately, we face not a direction, but toward a place of surrender - the heart (Mt. 6:6; Lk. 17:21). The heart bowing itself in this direction experiences a profound singleness. As the intellect gives way, the heart is raised to God, seeing all prayer as turning this way in surrender. "I've come to remember the Name"
"I've come to take refuge in the Name"
The left side is closest to the heart so we bring our heart into the place of worship first. We leave on our right foot so that the heart is the last to leave (the first to enter and the last to leave) reminding that our heart is always there - always at the place of worship. May you as you can, take up this practice. The Second Sunday of Lent is known as "Blessed Silence Sunday" at St. Simeon Skete. In the readings for tomorrow it says "But He answered not a word" (Matthew 15:23). "Invoke the Name of God, that's all we can do on our side until God responds and leaves us wondering in silence. But that moment of silence changes all sounds. 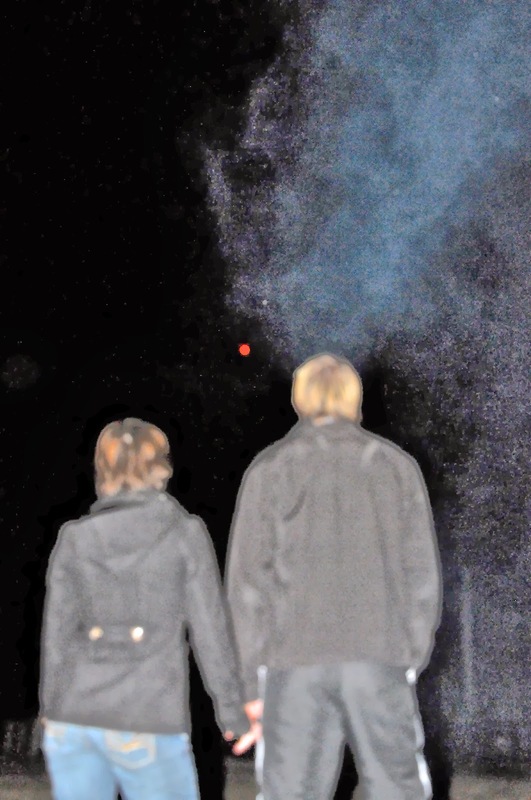 After a certain time, we were embellished by misery and certitude grew." - Seraphim (concerning our time in Egypt). A gentle rain is falling at the skete, the skies are dark, snow is predicted and the winds are kicking up. This morning as we walked to the Chapel it was 61℉. The meteorologists say it will be 18℉ when we walk to the Chapel on Thursday morning. This Winter's weather has been intense, to say the least. It is quiet here, very quiet. Rosary Class has just ended and afterward we had a wonderful time of fellowship as we broke bread together around the table at Anna House. Just an hour before Rosary Class begun, our Spring Break Guests were leaving. Anna and Jeff left for the North and Fr. Paul, Grant, Bethany, Carolyn and Vincent returned to the South. Anna and Jeff are part of the skete, coming here as often as their schedule allows. They know the routine and the skete has become "home away from home" to them. Fr. Sterne also is a familiar figure around here and has been a part of Nazareth House for many years. He is one of the few people who have traveled to Sierra Leone with us. This Spring break he brought with him (through the CS Lewis Student Center & St. Theodore's Chapel, Columbia, South Carolina) some kind souls who wished to offer themselves in any service they could. I wasn't sure how to deal with such an offer of generosity or what exactly they had in mind. We've had many come through these doors. We've had those who came out of curiosity to "check things out", we've had those who come to offer their opinion of how things should be done and we've had those who want to learn the ways of the skete to incorporate them back home and/or in the marketplace. There have been those who have come to deepen their prayer life, and even some that come here we still haven't figured out why. But here this week, we had people focussed on being of service to NHA and to the skete. 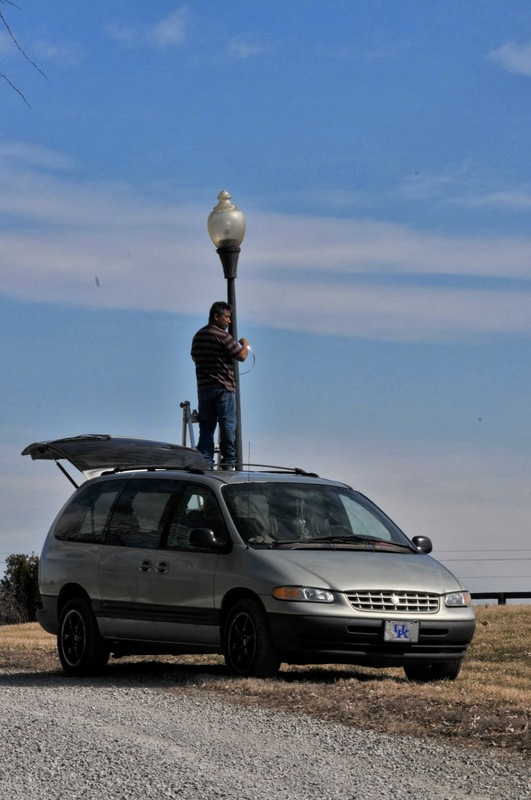 Vincent continually asked for us to give him work "I am full of energy, give me manual labor," he expressed. And that he did. With Carolyn, he trimmed down all the unruly dried up "monkey grass" so that its new shoots could resurface green and lush. They even cleaned out the chicken coop! On Monday and Tuesday of this week, they all volunteered to sort medical supplies in the name of Nazareth House Apostolate at Supplies Over Seas (SOS) in Louisville. This is the Non-Profit Organization that makes it possible for organizations like us to provide the much needed medical provisions in Sierra Leone. After completing a full days work at SOS, the group from The C.S. Lewis Student Center & St. Theodore's Chapel returned to the skete with a box full of wound care supplies and blood pressure cuffs to be sent to Sierra Leone ASAP. but other than dinner each night together and Compline we didn't get to see as much of each other as we would have liked - because everyone was working. and Jeff got all my printers and gadgets hooked up and synced. 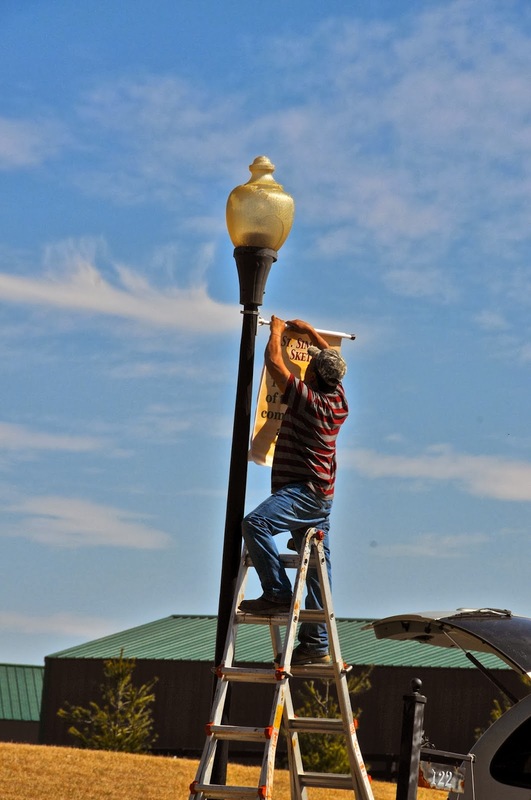 Jesús put up the Lamp Post Posters along the driveway. Spring Break Week at St. Simeon certainly helped us "Spring Forward" and we are most grateful for the tremendous help from everyone this week. ...and with everything in working order in my office there is much administrative work I must tend to so for now I bid you goodbye. Look for another post toward the end of this week. From the daily insights of working on the streets, in 1997 Seraphim put together this list of the hundred Names of Jesus. There are many more Names of Jesus within the Epistles but Seraphim restricted himself to only those taken from the Four Gospels. Pa Amadu Barrie, Waliullah and Seraphim had many deep discussions about the names of God. Destination: being my source and destination at the same time, Jn. 14:2,3. Emmanuel: God with us, Mt. 1:23. Friend: to be friendly, Mt. 11:9, Lk 7:34, Jn. 15: 12-14. Forsaken: God forsaking Himself for us, Mk. 15:34. Gift: to be given, Jn. 4:10. Governor: to direct my life, Mt. 2:5b-6. Lord of The Sabbath: making each day holy, Mt. 12:7-8. Lord and Master: before which I prostrate, Jn. 13:13; Lk. 8:24. Last: so taking the last place that no one has ever been able to get it away from Him, Mk.10:43b-45. New Wine: making all things joyfully new, Mt. 26:27, 29. The Towel and Water: example to be followed, Jn. 13:4-5, 12-15. Remember: that I may be ‘re’-membered, Lk. 22:19. Presence: Name gathering, Mt. 18:20. “ Your Name” : Jesus disguised as your life, Mt. 25:34-40. 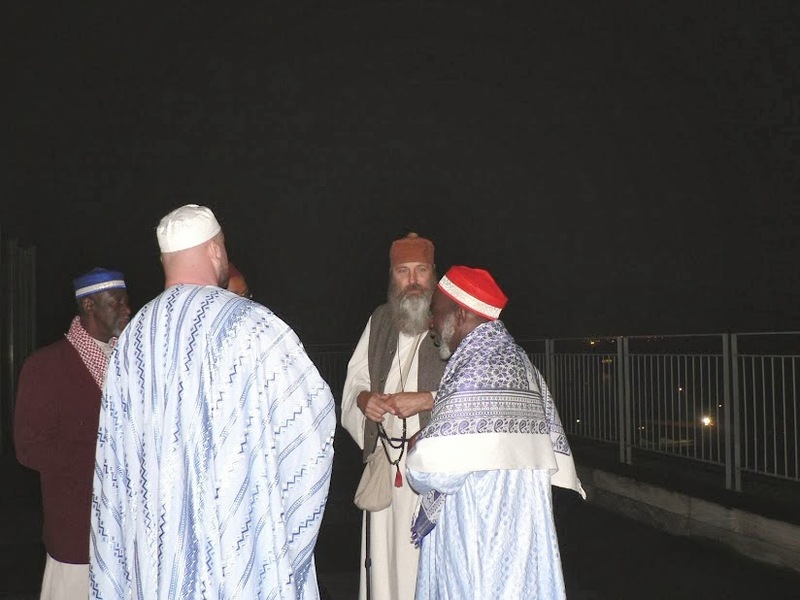 Sheik Huran of Senegal and Seraphim talk about the Names of God.